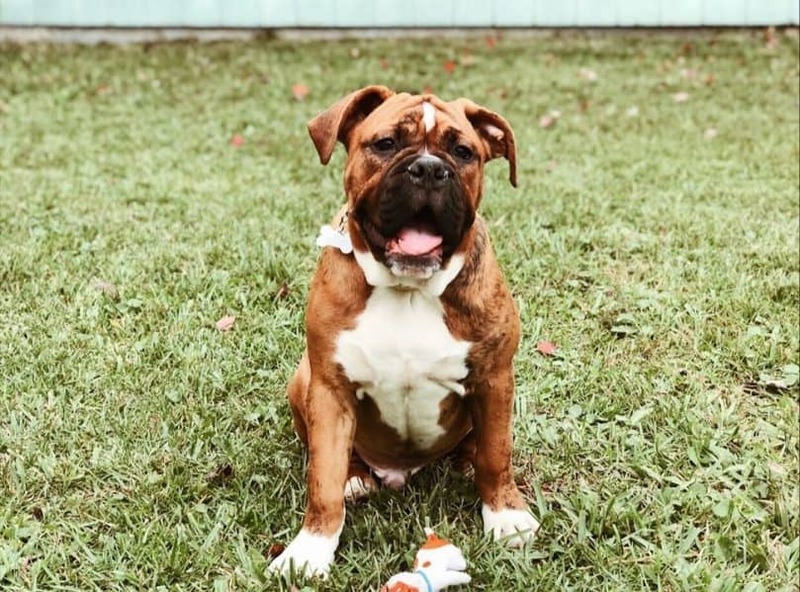 No matter what you choose to call this endearing dog, though, one thing’s for sure: the sweet face, calm temperament, and natural protective instincts of the Boxer Bulldog Mix will definitely win you over. 1. What exactly is a Valley Bulldog? 2. What does a Valley Bulldog look like? How big does a Valley Bulldog get? 3. Is the Valley Bulldog aggressive? 4. How can I train a Valley Bulldog? 5. How much exercise does the Valley Bulldog need? 6. Is the Valley Bulldog a high-maintenance breed? What is the ideal diet for a Valley Bulldog? What health issues does a Valley Bulldog have? 7. How much does a Valley Bulldog cost? A Valley Bulldog is the cross between an English Bulldog and a Boxer. This English Bulldog Boxer mix traces its origins to the Canadian region of Annapolis Valley, where the dog gets its name. These hybrids were developed as working dogs for catching livestock and protecting rural property like ranches and farms. Boxer Bulldog mixes remain to be effective guard dogs today, inheriting the Boxer’s alertness and suspicion of strangers. While the Bulldog Boxer Mix is originally a crossbreed, there have been 10 to 15 generations of purebred Valley Bulldogs produced by several breeding programs up until today. Most Boxer Bulldog mixes have the unmistakable facial features of the English Bulldog. English Bulldog Boxer hybrids often have a broad head, with rounded eyes and a muzzle that’s short to medium-length. Many of these crosses also inherit the Bulldog’s underbite. A Boxer Bulldog mix looks like either a taller version of an English Bulldog or a shorter version of a Boxer. Bull-Boxers usually have a thick neck, a broad chest and shoulders, and thick feet. The Bulldog Boxer mix’s muscular, sturdy build gives the dog an advantage when protecting your property and family. Many Boxer-English Bulldog crossbreeds also have the loose skin and prominent skin folds of the Bulldog. The Valley Bulldog’s coat usually has soft, smooth, short fur in white with brindle, tan, fawn, red, or black. The Boxer Bulldog mix is a small to medium dog, even when it’s full-grown. As adults, the Bulldog Boxer hybrid can reach heights of up to 15 to 18 inches (31 to 64 cm) at the shoulder. These dogs can weigh anywhere from 50 to 80 pounds (22 to 36 kg). Since the Bull-Boxer doesn’t need a lot of space, this dog makes a great pet for people living in apartments or condominiums. While its imposing build makes it look intimidating, the Boxer Bulldog mix is known for its stable, calm temperament. But that doesn’t mean this crossbreed doesn’t have its playful moments. Even when full-grown, a Boxer and Bulldog cross can exhibit a puppy’s excitable nature, especially around its family. Loyal and affectionate, Valley Bulldogs love to be around their owners. The crossbreed’s strong protective instincts make it a kid-friendly dog, but you’ll need to supervise playtime with toddlers and preschool-age kids. When socialized properly, the Bulldog Boxer mix gets along well with most animals. However, this hybrid will bark at sounds it doesn’t recognize. This is why the Boxer-Bulldog makes for an excellent watchdog. Valley Bulldogs are an intelligent breed, so training your dog to adopt positive behavior shouldn’t be a problem. Before you start training your Boxer and Bulldog mix to ‘sit’ or ‘stay,’ though, you should establish your position as the pack leader. Once your dog sees you as the pack leader, you can more easily control the Boxer-Bulldog mix’s tendency to be independent and stubborn. Boxer and bulldog hybrids need firm but gentle handling as they’re being trained. Instead of punishing your dog’s behavior, use positive reinforcement in the form of treats and praise when your Bull-Boxer follows your commands. The Bulldog and Boxer mix has medium energy levels, since the Bulldog’s docile, lazy nature tempers the Boxer’s athleticism. This is why Boxer and Bulldog mixes are the ideal pet for people who don’t have the time or the energy to take care of a high-energy dog. The crossbreed needs at least 60 minutes of exercise each day. Your Valley Bulldog will love going out for long, brisk walks or play games such as fetch or jumping for Frisbees. If your Boxer-English Bulldog inherited the short snout of its Bulldog parent, you’ll want to monitor its physical activity during hot weather. A short muzzle makes breathing difficult for the English Bulldog and Boxer mix, and strenuous exercise may worsen the ordeal for your dog. The Boxer and Bulldog mix is a fairly low-maintenance breed, especially when it comes to grooming. The crossbreed sheds no more than the average amount and it won’t leave clumps of fur around your home. Just brush the Valley Bulldog’s coat once a week to keep it healthy and shiny. Unfortunately, even with this crossbreed’s low to average shedding, the Boxer-English Bulldog cross is not hypoallergenic. 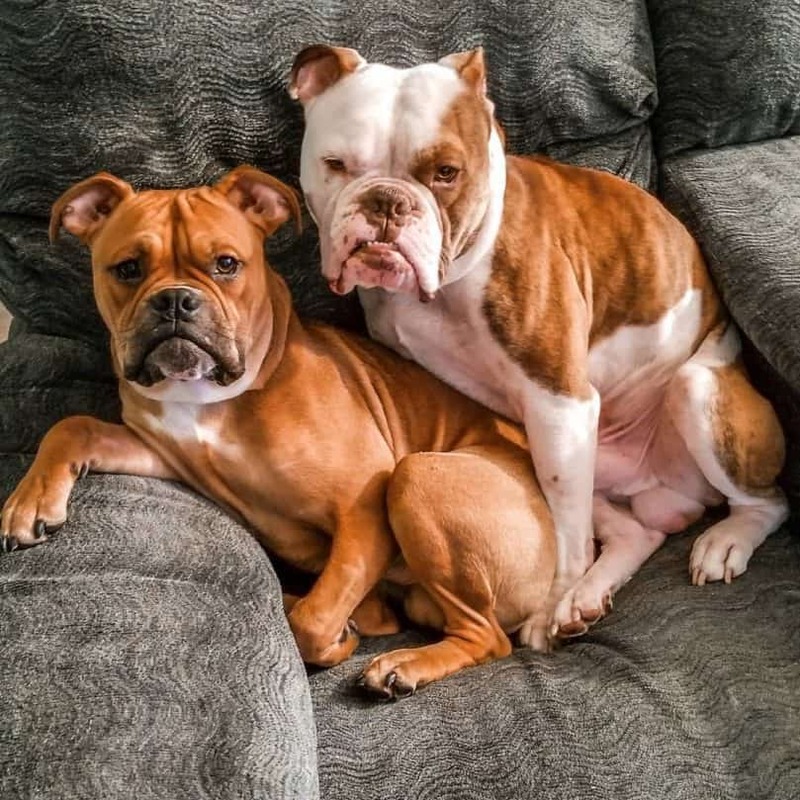 You need to pay special attention to the Boxer Bulldog mix’s folds or wrinkles because these dogs are prone to skin irritations and allergic reactions. Use warm water and a washcloth to clean between the folds and remove debris or food buildup, especially from the wrinkles on your Bulldog-Boxer’s head. Thoroughly dry the folds after cleaning to prevent bacterial growth. The Boxer Bulldog mix doesn’t really need frequent baths. You should give your Bulldog and Boxer mix a bath only every month or two to avoid stripping his coat of natural oils. If you feel like your dog is getting too dirty or smelly between baths, you can wipe him down with a wet cloth instead. English Bulldog and Boxer mixes may inherit the hearty appetite of its parent breeds, but it’s best to keep the Valley Bulldog’s diet to 3 cups of dry dog food per day. Make sure to split the food into two meals throughout the day. Dry dog food for Bulldog breeds is an excellent choice for feeding the Valley Bulldog. It’s best to give your dog food that is free of preservatives and artificial colors and flavors, especially since your Bulldog-Boxer mix may inherit the Bulldog’s sensitive digestive system. This hybrid is prone to obesity, so the Bulldog and Boxer cross’ food intake must be closely monitored. 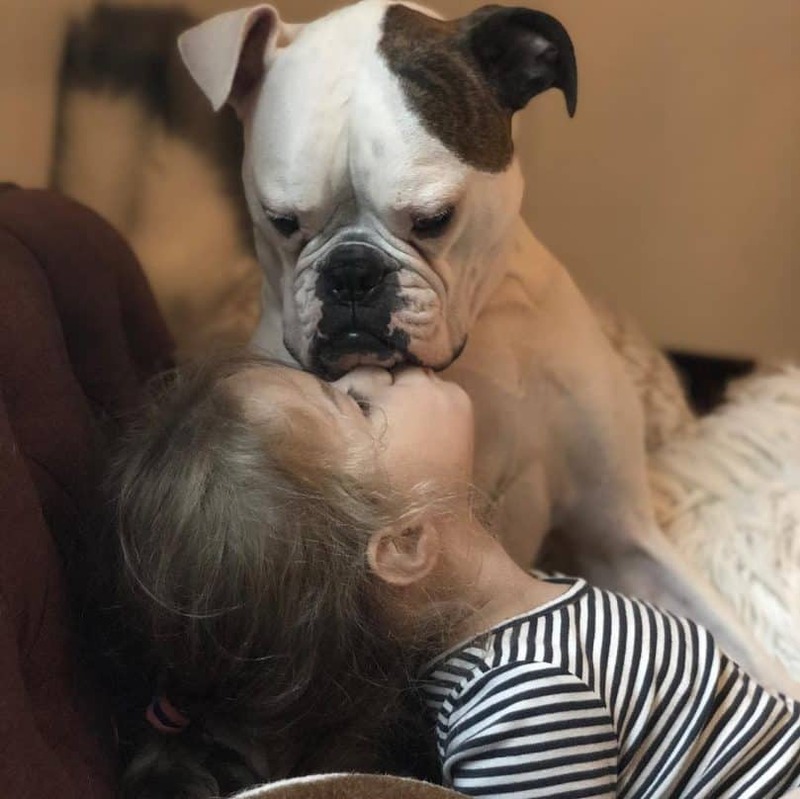 Boxer Bulldog hybrids are generally healthy dogs, since breeding the Boxer with the English Bulldog has eliminated many common health issues of the parent breeds. A healthy Valley Bulldog has a life expectancy of 10 to 12 years. Unfortunately, like most Bulldog owners, you may have to deal with some snoring and flatulence with your English Bulldog and Boxer mix. As we’ve said before, the Bull-Boxer’s folds are also prone to skin irritations and allergic reactions. You may also notice some head tremors in your Valley Bulldog, especially since these tremors are most commonly seen in Boxers and Bulldogs. The cause for these episodes is unknown, but they’re usually harmless. Boxer Bulldog mixes are in demand today because of their endearing appearance and affectionate nature. You can expect Valley Bulldog puppies to cost anywhere from $500 to $1900 each. Make sure to look for reputable Boxer Bulldog mix breeders who health-screen puppies for serious health conditions. This way, you can get the healthiest English Bulldog-Boxer puppy for your family. The Valley Bulldog is one of the best pets you can get for your family. This crossbreed has a stable, calm temperament that makes it ideal even for families with young kids. Plus, the Bulldog and Boxer hybrid doesn’t need a lot of space, so it will be happy even in an apartment. Boxer Bulldog mixes are also natural guardians, thanks to their strong protective instincts. These dogs won’t hesitate to bark to let you know of intruders on your property. To properly train a Boxer and Bulldog cross, though, you have to establish yourself as the pack leader. Positive reinforcement also goes a long way in teaching the Valley Bulldog positive behavior. Leave a comment if you want a Valley Bulldog for your family!